DANFORTH, ASA, colonizer and road builder; b. 29 June 1768 in Brookfield, Mass., son of Asa Danforth and Hannah Wheeler; m. there in 1789 Olive Langdon, and they had three daughters; d. in or after 1821. Asa Danforth Sr moved with his family to New York’s Onondaga valley in 1788. Asa Danforth Jr returned to his birthplace the following year to marry and shortly afterwards settled with his bride at Salt Point, later Salina (Syracuse), N.Y., where he manufactured salt. 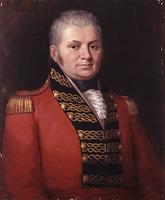 His father was a prominent figure in the Onondaga area and was described in 1794 by Upper Canada’s first lieutenant governor, John Graves Simcoe*, as “the most virulent enemy of Great Britain in that Country.” Thus, it was somewhat surprising when young Danforth appeared in the province in 1797 seeking the favours of government. 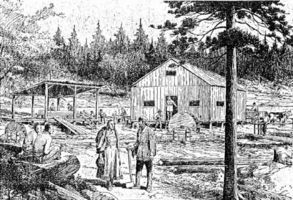 In 1792 Simcoe had initiated a policy of entrusting whole townships to the exclusive control of colonizers in the hope of promoting rapid settlement. There apparently was a misunderstanding as to the benefits promised to the township promoters; they seem to have thought they had been promised an outright grant of their townships if they succeeded in establishing a certain number of new settlers. In fact they were only entitled to 1,200 acres of land and the right to settle people where they pleased. In any case, it soon became evident that the scheme was a failure. In May 1796 Simcoe proclaimed many of these townships forfeited for lack of settlement, and declared that those who claimed to have settled their townships must submit their proofs to the Executive Council on or before 1 June 1797. Danforth was, as he put it, “connected . . . in Settling” the townships of Haldimand, Hamilton, Percy, and Cramahe, and to demonstrate that the proprietors’ obligations had been met in these townships he appeared before the council in 1797 to ask that some 205 settlers there be confirmed in possession of their lots. Simcoe’s successor, President Peter Russell*, had a more conciliatory approach to the proprietors than Simcoe. Thus, in July 1797 the unforfeited townships were reopened but the proprietors, Danforth included, were allowed 1,200 acres each if they became residents of the province. 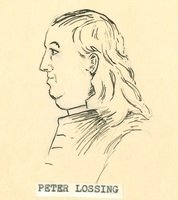 The council’s decision fostered a good deal of discontent and under the leadership of William Berczy*, one of the most disappointed of the proprietors, caveats were being filed contesting the council’s right to grant lands previously entrusted to proprietors. To protect their claims to the four townships, Danforth and his associates directed their attorney, William Weekes*, to join in filing caveats. Outraged, the council dismissed this action as “most improper and unfounded” and rescinded its recommendation that Danforth be granted 1,200 acres personally. Early in 1799 Danforth apologized, explaining that he was bound to people in the United States “to use every exertion that might be made” and that no “disrespect” had been intended. His apology was accepted and the council restored his personal grants. His problems, however, were not at an end. In 1798 two settlers who had been part of the colonization of the four townships complained to the council that Danforth’s name, rather than their own, had been entered against the lots which they had settled and improved. The council ordered an investigation and on the basis of the subsequent report (tabled in 1799) Danforth and his associates were accused of fraud and duplicity. As a result, all previous confirmations of lots in these townships were suspended; no new warrants for land were issued until 1 July 1800 and then only upon proof of actual improvement. It is somewhat surprising therefore that, while this investigation was proceeding, the council on Russell’s recommendation had contracted on 9 April 1799 with Danforth to open a road from York (Toronto) to the mouth of the Trent River. With causeways and bridges it was to be completed by 1 July 1800. Danforth was to be paid portions of what was owed him as the road progressed and was inspected, the balance upon completion. He did not receive his payments promptly, and was hampered by a shortage of capital. During a brief absence in the United States in March 1800, he was jailed as a debtor. Released, he returned to Upper Canada in May, sought and was allowed an extension, and completed the road on 18 December. The council was not satisfied with his work. He received a partial payment but was told no further payments would be made until the road was properly finished. A bitter Danforth returned briefly to the United States where the pressure from his creditors had not abated. He claimed to have had several conversations with presidential candidate Aaron Burr. Danforth anticipated that a Republican triumph in the election would “afford something handsome to those who were draged from home by fair promises of Genl. Simcoe and the like . . . when the Executive Council saw that our Americans had made choice of the best lands in the Province they laid a plan to recind & take away the Lands theretofore granted and placed their own locations on the same.” Danforth believed that Upper Canadian officials feared the likelihood of the eclipse of British power in North America but that “three-fourths of the common people would be happy of a Change.” Back in the province in June 1801 he was hopeful of a favourable settlement on his claims for land and money. Disappointed yet again he left the province for good in January 1802. Before departing Danforth laid plans for a meeting in Albany, N.Y., of disgruntled Upper Canadians. Among those he wished to include were Joseph Brant [Thayendanegea*], Ebenezer Allan*, and Silvester Tiffany*. The purpose was the overthrow of the provincial government. Several meetings apparently took place but nothing came of the plan. As late as 1806 Danforth saw a possibility for recovering land and money. In this instance Weekes’s successful attack on Lieutenant Governor Peter Hunter*’s handling of public money was the source of his hope. Danforth spent some years at Salina working his salt leases, constantly hampered by lack of capital and forced to borrow to finance necessary improvements. In 1811 he leased his salt privileges and equipment to his principal creditor, who eventually acquired out-right ownership of the property as well. Last notice of Danforth dates from 1821. He was in New York City hiding from the sheriff. The road for which he is famous fared little better. Official reports of October 1802 were highly critical. Deficient from the outset, within a few years it had deteriorated and was largely unused. PAC, RG 1, E3, 32: 37–43; RG 5, A1: 557–59. Syracuse Univ. Libraries, George Arents Research Library (Syracuse, N.Y.), Green family coll., Timothy Green papers. Corr. of Hon. Peter Russell (Cruikshank). 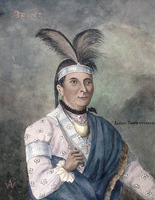 Onondaga Hist. Soc., Pub. (Syracuse), 1913: 134–36; 1914: 168. “U.C. land book D,” AO Report, 1931. Danforth genealogy: Nicholas Danforth, of Framlingham, England, and Cambridge, N.E. (1589–1638) and William Danforth, of Newbury, Mass. (1640–1721) and their descendants, comp. J. J. May (Boston, 1902). Canniff, Hist. of the settlement of U.C. J. V. H. Clark, Onondaga, or reminiscences of earlier and later times . . . (2v., Syracuse, 1849; repr. Millwood, N.Y., 1973), 2: 108, 139–40. Cowdell Gates, Land policies of U.C. George Geddes, Report on the agriculture and industry of the county of Onondaga, state of New York . . . from the transactions of the N.Y. State Agricultural Society, 1859 (Albany, 1860). J.-P. Wallot, Intrigues françaises et américaines au Canada, 1800–1802 (Montréal, 1965). C. J. Werner, A history and description of the manufacture and mining of salt in New York State (Huntington, N.Y., 1917), 28–29. L. F. [Cowdell] Gates, “Roads, rivals, and rebellion: the unknown story of Asa Danforth, Jr.,” OH, 76 (1984): 233–54. Lillian F. Gates, “DANFORTH, ASA,” in Dictionary of Canadian Biography, vol. 6, University of Toronto/Université Laval, 2003–, accessed April 20, 2019, http://www.biographi.ca/en/bio/danforth_asa_6E.html.